Background Practitioner beliefs and attitudes towards low back pain (LBP) influence treatment decisions. Little is known about pharmacists’ knowledge, attitudes and beliefs towards LBP. Objectives To investigate the effect of educational interventions on pharmacists’ knowledge, attitudes and beliefs towards LBP. Setting Sydney Metropolitan Area. 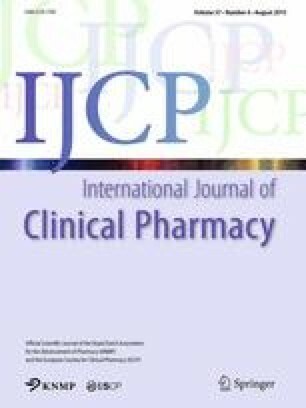 Methods Knowledge, attitudes and beliefs was measured using the “Pharmacists’ Back Beliefs Questionnaire”, with items from two previously reported questionnaires on back beliefs. Responses from pharmacists attending a 2-h educational workshop on LBP (n = 204) and pharmacists recruiting participants for a LBP clinical trial (n = 66) were compared to responses from a control group of pharmacists (n = 65) to allow an evaluation of the two interventions. Responses from workshop participants were also evaluated before and after the session. Participants indicated their agreement with statements about LBP on a 5-point Likert scale. Preferred responses were based on guidelines for the evidence-based management of LBP. The primary analysis evaluated total score on the nine-inevitability items of the Back Beliefs Questionnaire (“inevitability score”). Main outcome measure Inevitability score. Results There was no significant difference in inevitability score between LBP clinical trial pharmacists and the control group [mean difference (MD) 0.47 (95 % CI −1.35 to 2.29; p = 0.61)]. The educational workshop led to a significant and favourable change in inevitability score (MD 7.23 p < 0.001) and notable changes in responses to misconceptions regarding bed rest and the need for imaging (p < 0.001) among participating pharmacists. Conclusions Pharmacists attending the educational workshop provided the most compelling evidence that education specifically aimed at delivering evidence-based information can be successful in changing practitioner knowledge, beliefs and attitudes towards LBP. The online version of this article (doi: 10.1007/s11096-015-0112-5) contains supplementary material, which is available to authorized users. The authors gratefully acknowledge the support of Dr Christine Lin, Mr Daniel Steffens, Ms Paula Beckencamp, Ms Pauline Zahara, Ms Dominique Bartlett, Mr Tarscisio Folly, Ms Amanda Hese, Ms Anurina Das, Dr Sasha Bennett, Mr Vidya Perera and all the pharmacists who participated in this study. The authors also acknowledge the financial support of The George Institute for Global Health. This research received no specific funding from any funding agency in the public, commercial or not-for-profit sectors. CAS is supported by an Australian Postgraduate Award. CGM is supported by a research fellowship funded by the National Health and Medical Research Council. CGM and AJM are investigators on the PACE trial (http://www.anzctr.org.au/ACTRN12609000966291.aspx) which is jointly funded by a project grant from the National Health and Medical Research Council and GlaxoSmithKline. Gross D, Russell A, Ferrari R, Crites Battie M, Schoplocher D, Hu R, et al. The Alberta Back Pain Initiative Study: Evaluation of a population-based social marketing intervention study for the prevention of disability associated with low back pain. Final report Available at: http://www.worksafebc.com/contact_us/research/research_results/res_60_10_810.asp. Accessed June 5, 2013. Doctors4U®—Sydney Doctors Medical Directory (2011) A-to-Z: Sydney Chemists and Pharmacies by location. http://www.doctors-4u.com/sydney/chemists_sub.htm. Accessed August 3, 2011. Charlton JE (2005) Core curriculum for professional education in pain. Accessed from: http://www.iasp-pain.org/AM/Template.cfm?Section=IASP_Press_Books2&Template=/CM/ContentDisplay.cfm&ContentID=2008. Accessed June 18, 2011. Australian Institute of Health and Welfare: General Characteristics of persons involved in health and community services occupations. http://www.aihw.gov.au/publication-detail/?id=6442468220&tab=3. Accessed July 28, 2013. Pharmacy Board of Australia. Pharmacy Registrant Data. http://www.pharmacyboard.gov.au/About/Statistics.aspx. Accessed April 22, 2014. National Prescribing Service. National Medicines Symposium Poster. A brief education session and participation in a clinical trial both improve pharmacists’ knowledge of evidence-based low back pain management. http://nms2012.digitalposters.com.au/posters-topics/2. Accessed July 29, 2014.